Geert van den Goor calculates that his direct-cut alfalfa saves 80 cents to $1 per cow per day in feed costs. The Michigan dairyman feeds about 8 pounds per head per day (dry matter) of the green feed through a totally mixed ration. There was a time when greenchopping was a common occurrence on many U.S. dairy farms. It was a part of the daily routine to hook up the flail chopper and feeder wagon, make a few rounds in the field, unhook the chopper, then rehook the wagon to the tractor and pull it to the awaiting livestock. Twelve or 24 hours later, the routine was repeated after manually cleaning out any leftover feed in the wagon. As farms grew in size, greenchopping was slowly but surely replaced by either stored, fermented feed or managed grazing. These days, it’s rare to visit a dairy farm with a flail chopper that’s located somewhere other than a tree line in the back 40. Greenchopping, however, hasn’t been left behind by advances in technology and remains a popular means of harvesting and feeding hay crops in Europe. Some U.S. farmers are also embracing the practice with the availability of self-loading forage wagons. “It takes a lot of management, but our feed ration calculations tell us we’re saving 80 cents to $1 per cow per day by including green feed in the TMR (total mixed ration),” said Geert van den Goor, who began greenchopping in 2016. He and his wife, Gertie, own and operate Goma Dairy in Michigan’s Thumb region near Marlette. The van den Goors moved their dairy operation from the Netherlands to Michigan in 1999 after purchasing an existing 350-acre farm. At that time, they milked about 300 cows. Over the years, the farm has grown and now has 2,900 milking cows plus dry cows and young stock. The van den Goors own 1,850 acres, which provides most of the alfalfa and corn silage needed for feeding the milking herd and young stock. About 900 of the owned acres are rented to a neighboring farmer, and the feed is purchased back as haylage and corn silage. The remaining owned acres, except for those being greenchopped, are custom harvested. Van den Goor also buys standing hay from neighbors. The Goma Dairy milking herd receives a 60 percent forage ration that includes about 8 pounds of greenchopped alfalfa (dry matter basis), 9 pounds of haylage, 15 pounds of corn silage, and 3 pounds of dry hay. “You have to really watch the dry matter on the greenchop because it changes with maturity,” van den Goor said. “We routinely test the feed and adjust the amount of green feed to keep the ration nutrient intake consistent. Generally, 8 pounds of greenchop replaces 5 pounds of grain and 3 pounds of haylage in the ration,” added van den Goor. There is a lot of forethought and planning that must take place when meshing a greenchop harvest with conventionally harvested haylage. Essentially, there must be alfalfa that is within a harvestable greenchopping range every day during the growing season. Once a rotation is established in the spring, plant maturity becomes staggered for future harvests. Van den Goor noted that they usually have to bring additional alfalfa acreage into the greenchopping rotation during the summer when forage yields begin to wane. When van den Goor made the jump to greenchopping in 2016, he purchased a used Pottinger self-loading forage wagon. Though it worked fine, a larger unit was needed to efficiently harvest enough feed on a daily basis. 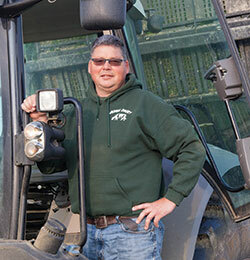 After conferring with his brother in the Netherlands and talking to others, van den Goor settled on a Krone ZX 560 GL wagon, which he pulls with a Fendt 828, 280-horsepower tractor. On the front of the tractor is mounted a PTO-driven Krone disc mower. Van den Goor doesn’t see getting parts for the machine as a problem, though if he needs something fast, it might be more costly. “Some of the major components are similar or the same as what Krone has on other machines. For example, the pickup header is the same as what is on a baler,” he noted. 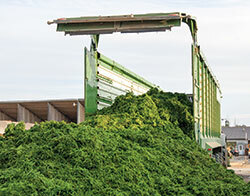 The self-loading forage wagon has a capacity of 73 cubic yards and carries 30 tons of wet greenchop. Van den Goor also uses it as a traditional silage wagon for conventional harvest activities to expand its utility. The forage is cut and then brought into the wagon with a standard pickup head. The feed rotor moves the forage between a series of knives, which can be removed as desired to adjust for length of cut. A dual-slatted floor chain and pivoting headboard assist in loading and unloading the wagon. It’s yet to be seen how the greenchopping field activities will impact alfalfa stand longevity. Van den Goor has been getting four to five years of production out of his fields before being rotated to corn. “That’s something we’ll have to monitor in the future,” he said. Hay & Forage Grower columnist Adam Verner discussed self-loading silage wagons in the February 2017 issue on page 32. He thought that the units might have the most utility on smaller farm operations. Regardless of farm size, one thing is for sure . . . today’s modern greenchopper bears little resemblance to those of years gone by. This article appeared in the November 2017 issue of Hay & Forage Grower on pages 22 and 23.